Grinspoon and Stern’s book dives behind the scenes into what it takes to send a space probe to Pluto. On July 14, 2015, the interplanetary space probe known as New Horizons flew past Pluto and gave humans the first up-close view of the dwarf planet. Back on planet Earth, the people behind New Horizons celebrated their long-held dream finally coming true. The journey from conception to realization is chronicled in the new book Chasing New Horizons, written by Stern and astrobiologist David Grinspoon. 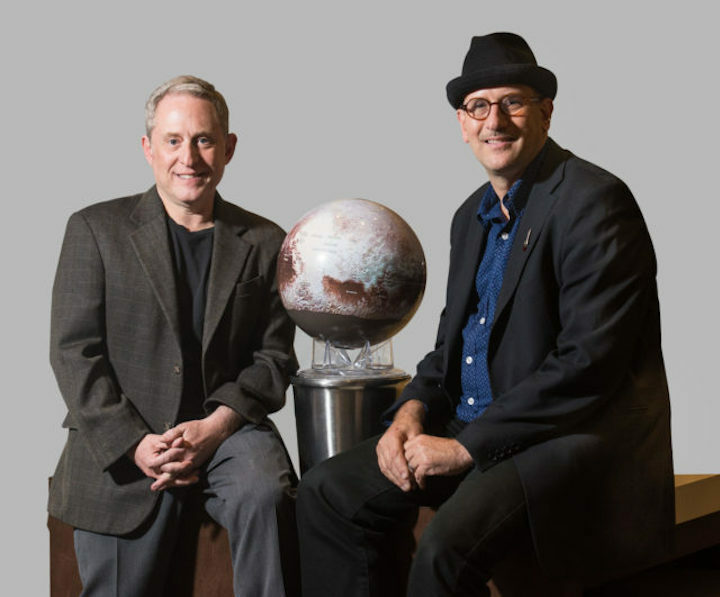 On May 19, Grinspoon and Stern willstop by the Boulder Book Store to talk more about their book and the mission to Pluto. The early inklings of a trip to Pluto came about in the late ’80s. But it wasn’t until 2001 that Stern and his team were selected. Throughout the process, the New Horizons project was cancelled, put on hold, and even had a computer malfunction only days before it was scheduled to encounter Pluto. Involved with the probe peripherally, Grinspoon says he was always a longtime fan and cheerleader. He hopes the book provides insights into the reality of space exploration. Pluto is approximately 4.67 billion miles from Earth. When constructing New Horizons, the team created a small, lightweight spacecraft that would be able to traverse the solar system. There was also a tight deadline. The probe needed to launch by 2006 because there was a short window of time where Jupiter would be in the right place to slingshot New Horizons into Pluto’s orbit. To get funding for any space exploration is a feat in itself, especially considering the number of projects vying for the limited amount of resources at NASA’s disposal. And Grinspoon says the project was met with skepticism. Thankfully, Pluto provided a wealth of new information, even more than expected. Stern lists multiple significant features on Pluto including ice volcanoes, avalanches, Texas-sized glaciers, ancient craters next to new terrain, a complex atmosphere, weather and evidence of water oceans underneath the surface. Both Grinspoon and Stern say scientists were surprised to discover how active, dynamic and diverse the planet turned out to be. With every new piece of information we learn about the universe, we can better understand our own planet and its origins. And New Horizons’ journey isn’t over. As 2019 dawns, the probe will fly past a small object, known as Ultima Thule, in the Kuiper Belt. Stern calls it a building block of the solar system that will help us learn more about the formation of the planets. After it passes Ultima Tulle, New Horizons will continue on.